veeraditya has no other items for sale. Owner wants to sell this work Quickly. 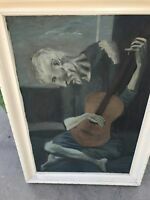 Fine Rare Unique Cubist Portrait painting, signed, Pablo Picasso with COA docs. Rare Unique Cubist Portrait painting, signed, Pablo Picasso with COA docs. Free shipping on orders over $2,500.00 when you buy veeraditya's other eligible items.